For people in parts of Daly and Arnhem districts. Issued at 9:26 pm Thursday, 6 December 2018. Weather Situation: A trough lies at the base of the Top End with an environment favourable for SEVERE thunderstorms to its north. Severe thunderstorms are likely to produce damaging winds in the warning area over the next several hours. 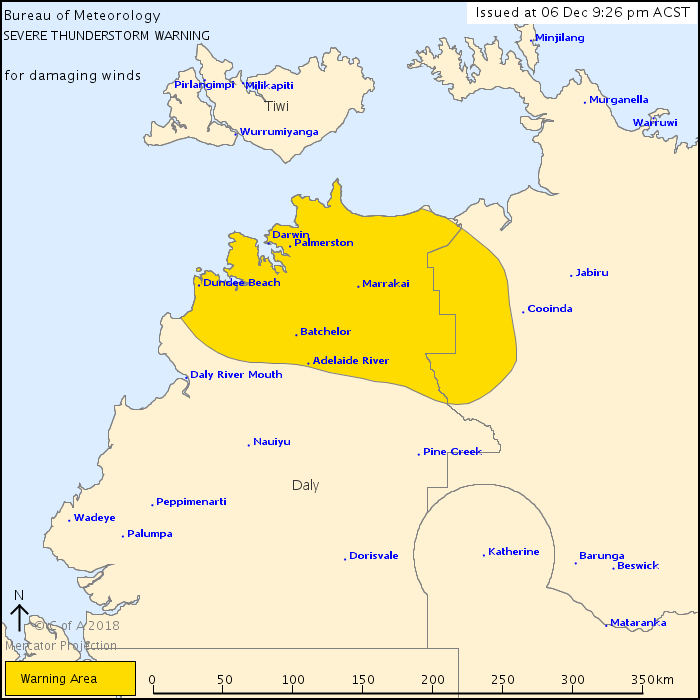 Locations which may be affected include Darwin, Palmerston, Batchelor, Adelaide River, Dundee Beach and Marrakai. At 4:09pm ACST a 91km/h wind gust was recorded at Tindal Airport.